"In my opinion, a collapse of the WAIS this century would likely accelerate schedule for the long overdue flipping of the Earth's magnetic poles. " Interesting. What leads you to this opinion ? Do tell. Abstract: "We present new paleomagnetic data from three Middle Neoproterozoic carbonate units of East Svalbard, Norway. The paleomagnetic record is gleaned from 50 to 650 m of continuous, platformal carbonate sediment, is reproduced at three locations distributed over >100 km on a single craton, and scores a 5–6 (out of 7) on the Van der Voo (1990) reliability scale. Two >50° shifts in paleomagnetic direction are coincident with equally abrupt shifts in δ13C and transient changes in relative sea level. We explore four possible explanations for these coincidental changes: rapid plate tectonic rotation during depositional hiatus, magnetic excursions, nongeocentric axial-dipole fields, and true polar wander. We conclude that the observations are explained most readily by rapid shifts in paleogeography associated with a pair of true polar wander events. Future work in sediments of equivalent age from other basins can test directly the true polar wander hypothesis because this type of event would affect every continent in a predictable manner, depending on the continent's changing position relative to Earth's spin axis." Abstract: "Palaeomagnetic studies of Palaeoproterozoic to Cretaceous rocks propose a suite of large and relatively rapid (tens of degrees over 10 to 100 million years) excursions of the rotation pole relative to the surface geography, or true polar wander (TPW). These excursions may be linked in an oscillatory, approximately coaxial succession about the centre of the contemporaneous supercontinent. Within the framework of a standard rotational theory, in which a delayed viscous adjustment of the rotational bulge acts to stabilize the rotation axis, geodynamic models for oscillatory TPW generally appeal to consecutive, opposite loading phases of comparable magnitude. Here we extend a nonlinear rotational stability theory to incorporate the stabilizing effect of TPW-induced elastic stresses in the lithosphere. We demonstrate that convectively driven inertia perturbations acting on a nearly prolate, non-hydrostatic Earth with an effective elastic lithospheric thickness of about 10 kilometres yield oscillatory TPW paths consistent with palaeomagnetic inferences. This estimate of elastic thickness can be reduced, even to zero, if the rotation axis is stabilized by long-term excess ellipticity in the plane of the TPW. We speculate that these sources of stabilization, acting on TPW driven by a time-varying mantle flow field, provide a mechanism for linking the distinct, oscillatory TPW events of the past few billion years." Do you mean magnetic pole or rotational pole ? both the papers you cite talk about the rotational pole. I will move this line of discussion to the 'Ice Apocalypse' thread (see the link below) in the Antarctic folder as this topic was meant to be just a word of warning here. However, my general point is that a some portion of the changes in the magnetic pole can be associated with changes in the rotational pole (the attached image illustrates how fast this is currently changing), due to changes in the magma flow associated with ice mass redistribution. Furthermore, my point is that due to the current exceptionally high rate of anthropogenic forcing and the bipolar seesaw mechanism that possible abrupt changes in ice mass loss can make faster changes in tectonic behavior than observed in the paleorecord. As a follow on to my last series of re-posts about correlating true polar wander (shifting of the Earth's rotational axis) and magnetic field reversals and mass redistribution around the Earth; I provide the first linked reference that provides paleo evidence that during periods of little polar wander the is reduced activity of magnetic pole flipping; while the second linked article makes it clear that polar wander is associated with all mass (ice, sea level, groundwater, isostatic rebound) redistribution. Also, Hansen's ice-climate feedback results in changes in precipitation patterns that will affect polar wander. Abstract: "True polar wander, the shifting of the entire mantle relative to the earth's spin axis, has been reanalyzed. Over the last 200 million years, true polar wander has been fast (approximately 5 centimeters per year) most of the time, except for a remarkable standstill from 170 to 110 million years ago. This standstill correlates with a decrease in the reversal frequency of the geomagnetic field and episodes of continental breakup. Conversely, true polar wander is high when reversal frequency increases. It is proposed that intermittent convection modulates the thickness of a thermal boundary layer at the base of the mantle and consequently the core-to-mantle heat flux. Emission of hot thermals from the boundary layer leads to increases in mantle convection and true polar wander. In conjunction, cold thermals released from a boundary layer at the top of the liquid core eventually lead to reversals. Changes in the locations of subduction zones may also affect true polar wander. Exceptional volcanism and mass extinctions at the Cretaceous-Tertiary and Permo-Triassic boundaries may be related to thermals released after two unusually long periods with no magnetic reversals. These environmental catastrophes may therefore be a consequence of thermal and chemical couplings in the earth's multilayer heat engine rather than have an extraterrestrial cause." Title: "Climate Change Is Moving the North Pole"
Extract: "As ice melts and aquifers are drained, Earth's distribution of mass is changing—and with it the position of the planet's spin axis." Abstract: "Earth’s spin axis has been wandering along the Greenwich meridian since about 2000, representing a 75° eastward shift from its long-term drift direction. The past 115 years have seen unequivocal evidence for a quasi-decadal periodicity, and these motions persist throughout the recent record of pole position, in spite of the new drift direction. We analyze space geodetic and satellite gravimetric data for the period 2003–2015 to show that all of the main features of polar motion are explained by global-scale continent-ocean mass transport. The changes in terrestrial water storage (TWS) and global cryosphere together explain nearly the entire amplitude (83 ± 23%) and mean directional shift (within 5.9° ± 7.6°) of the observed motion. We also find that the TWS variability fully explains the decadal-like changes in polar motion observed during the study period, thus offering a clue to resolving the long-standing quest for determining the origins of decadal oscillations. This newly discovered link between polar motion and global-scale TWS variability has broad implications for the study of past and future climate." Abstract: "The Cambrian true polar wander (TPW) hypothesis remains controversial largely because of the uncertainties in the quality and/or fidelity of the paleomagnetic data as well as their chronological control. Testing the TPW hypothesis requires high-quality paleomagnetic data of sufficient spatial and temporal resolutions. Here, we present paleomagnetic results of a continuous Cambrian shallow marine succession from South China where available detailed biostratigraphy provides exceptional chronological constraints. Forty-three sites of paleomagnetic samples were collected from this limestone-dominated succession. Stepwise thermal demagnetization generally reveals three-component magnetizations. Low- and intermediate-temperature components can be cleaned by ∼330°C, and the high-temperature component (HTC) was isolated typically from ∼350 to ∼450°C. A positive fold test and the presence of reversed polarity in the strata, together with rock magnetic data as well as the scanning electron microscopic (SEM) and transmission electron microscopic (TEM) results, collectively suggest that the HTCs are likely primary. A directional shift of the HTCs occurs between the lower-middle Cambrian and the upper Cambrian strata in the succession and is tentatively interpreted to indicate a ∼57° polar wander from ∼500.5 to 494 Ma. Because the rate of polar wander is too fast to be a tectonic origin, this polar wander is interpreted to represent a Late Cambrian TPW. This TPW appears coeval with the Steptoean positive carbon isotope excursion (SPICE) and the major trilobite mass extinctions, suggesting a potential link between the TPW and the Late Cambrian biotic and climatic changes. Because the proposed TPW event is exceptionally well-dated, it should be testable through examination of other worldwide sections." And on the way to a reversal of poles, some scientists have said the magnetic field will do a polar vortex, i.e. weaken and become erratic. Bad news for our electro-magnetic society when a solar storm hits it. (No source - dredged up from a rusty filing cabinet in the brain from a long time ago at Uni when plate tectonics was still just a hypothesis and these flipflops played a big part to prove it). 1. The first image shows calculated values of inferred ECS with latitude based on recent surface temperature observations (and thus do not include slow response contributions. Things to note include: a. the inferred ECS near the North Pole is approximately 4.2C; b. the inferred ECS over the Southern Ocean is around 1.3C because Antarctic ice shelves have lost so much ice mass that they are already activating Hansen's ice-climate feedback mechanism, and c. the inferred ECS over most of Antarctica is around 2.5C, which is much less than that for the Arctic because of the relatively high surface elevation for most of Antarctica; which will change is the WAIS collapses. 2. The second image shows paleo values for Gain (in 'C per W/sq-m') compared to the AR5 likely range for these values vs frequency (in cycles/year). This shows both that the IPCC is highlighting linear response for what is a highly non-linear behavior and that long/fat tailed events (like freshwater hosing events) can have Gain values that are 2.5 times higher than assumed by the IPCC; which translates into higher than recognized resists for mankind. 3. The third image shows how the product of the frequency PDF for bad events times the expected magnitude of such bad events results in maximum risk towards 65% to 75% confidence level for the PDF. This means that policy makers should be working with the upper end of expected ECS range rather than with mean or mode values. Sea level rise is already slowing the earth's rate of rotation. To get the rotational pole to wander there must be differential rotation of the crust, mantle and/or core. Angular momentum of the earth moon system is conserved. Over long periods of time tides slow earth's rotation and the rotational energy is transferred to the moon. Abstract: "Supraglacial lakes on the Greenland Ice Sheet are expanding inland, but the impact on ice flow is equivocal because interior surface conditions may preclude the transfer of surface water to the bed. Here we use a well-constrained 3D model to demonstrate that supraglacial lakes in Greenland drain when tensile-stress perturbations propagate fractures in areas where fractures are normally absent or closed. These melt-induced perturbations escalate when lakes as far as 80 km apart form expansive networks and drain in rapid succession. The result is a tensile shock that establishes new surface-to-bed hydraulic pathways in areas where crevasses transiently open. We show evidence for open crevasses 135 km inland from the ice margin, which is much farther inland than previously considered possible. We hypothesise that inland expansion of lakes will deliver water and heat to isolated regions of the ice sheet’s interior where the impact on ice flow is potentially large." Title: "Chain reaction of fast-draining lakes poses new risk for Greenland ice sheet"
Extract: "A growing network of lakes on the Greenland ice sheet has been found to drain in a chain reaction that speeds up the flow of the ice sheet, threatening its stability." So Arctic peak winter ice volume is about 1% of Greenland's, and Greenland's is 10% of Antarctica's. Thus the heat which disposes of most of the Arctic's ice in summer, is having a significant input to Greenland's ice mass too. The less Arctic ice there is, the more the heat goes into the Greenland heat sink, and the adjacent ocean. Its kinda the inverse of a scheme to pay off debts. Pay off the smallest first, then there is much more to pay off the next. Get rid of Arctic ice, then with that job done that heat will hit Greenland hard. Hanson's exponential rate of change of SLR becomes more likely every day. Whoa, Neven, the sea ice has been restored and we're back in the '90s. Kids having innocent fun. These days kids here are acting like adults and the adults are acting like kids. These are dizzying times. It's so hard to get a handle on the rates of change and the probabilities of extreme events like rapid sea level rise. I wish we could retreat to the innocence of that video but we can't. ... However, my general point is that a some portion of the changes in the magnetic pole can be associated with changes in the rotational pole (the attached image illustrates how fast this is currently changing), due to changes in the magma flow associated with ice mass redistribution. Furthermore, my point is that due to the current exceptionally high rate of anthropogenic forcing and the bipolar seesaw mechanism that possible abrupt changes in ice mass loss can make faster changes in tectonic behavior than observed in the paleorecord. The first image shows the southern supercontinent Gondwana about 183million year ago at the point of the initial breakup of the supercontinent. The second image highlights the Euler geometry of hexagons and pentagons bounded by the supercontinent rupture lines that define the lines of minimum energy required to break apart the supercontinent. These two images illustrate the origins of the area known as the South Atlantic Anomaly – an expanse of the field currently stretching from Chile to Zimbabwe, as discussed in the reference linked (and the last two images) below. The Hare et al. (2018) linked open access reference indicates that this region is likely a key area of the Earth core-mantle boundary that is likely in the process of triggering a flip in the Earth's magnetic poles. Abstract: "The paucity of Southern Hemisphere archeomagnetic data limits the resolution of paleosecular variation models. At the same time, important changes in the modern and historical field, including the recent dipole decay, appear to originate in this region. Here a new directional record from southern Africa is presented from analysis of Iron Age (ca. 425–1550 CE) archeological materials, which extends the regional secular variation curve back to the first millennium. Previous studies have identified a period of rapid directional change between 1225 and ∼1550 CE. The new data allow us to identify an earlier period of relatively rapid change between the sixth and seventh centuries CE. Implications for models of recurrent flux expulsion at the core-mantle boundary are discussed. In addition, we identify a possible relationship of changes recorded in these African data with archeomagnetic jerks." Title: "A Mysterious Anomaly Under Africa Is Radically Weakening Earth's Magnetic Field"
Extract: "This could be precursor to Earth's poles swapping places. … the artefacts revealed that the weakening in the South Atlantic Anomaly isn't a standalone phenomenon of history. There's a lot more research to do before we know more about what's going on here. As the researchers explain, the conventional idea of pole reversals is that they can start anywhere in the core – but the latest findings suggest what happens in the magnetic field above us is tied to phenomena at special places in the core-mantle boundary." The very generation of earths magnetic field is poorly understood. Magnetic pole reversal is even less well understood. The impact of changing tectonics in response to ice unloading is also poorly understood and it's influence on magnetic field generation is not understood at all. I am aware of no literature suggesting that ice unloading will cause magnetic pole reversal, and i consider the notion quite farfetched. Abstract: "Glaciovolcanism is a young science that has undergone a major transformation during the last 15 years. It is important for a variety of reasons but it is set to play a major role in deriving critical parameters of past ice sheets and thus greatly improve the accuracy of their reconstruction. Glaciovolcanic studies can deduce a wider range of parameters than any other methodology currently existing, including: establishing the presence of ice, its age, ice thickness, ice surface elevation, and basal thermal regime. These attributes can be acquired routinely for many glaciovolcanic sequences and, uniquely, several are quantifiable. Most glaciovolcanic terrains provide punctuated rather than continuous records of the coeval ice sheet, i.e., with numerous time gaps. Despite the gaps, glaciovolcanic studies of ice sheets have been completed successfully in the three major glaciovolcanic regions of the Earth: mainly Antarctica, but also Iceland and British Columbia (Canada). Future studies in these and other glaciovolcanic regions will considerably improve our knowledge of Earth’s water inventory and contribute to a better understanding of past ice dynamics and the impact of the cryosphere on global climate." Title: "Shifting Ice Caps - Magnetic Poles and Ice Caps move in Tandem"
Extract: "“The rate of the magnetic pole’s movement has increased in the last century compared with fairly steady movement in the previous four centuries”, said Joseph Stoner and the Oregon researchers." Title: "Magnetic north pole drifting fast"
Extract: " The Earth's north magnetic pole is drifting away from North America so fast that it could end up in Siberia within 50 years, scientists have said." Title: "Large crack in East African Rift is evidence of continent splitting in two"
Extract: "A large crack, stretching several kilometres, made a sudden appearance recently in south-western Kenya. The tear, which continues to grow, caused part of the Nairobi-Narok highway to collapse and was accompanied by seismic activity in the area. Towards the Afar region, however, the entire rift valley floor is covered with volcanic rocks. This suggests that, in this area, the lithosphere has thinned almost to the point of complete break up. When this happens, a new ocean will begin forming by the solidification of magma in the space created by the broken-up plates. Eventually, over a period of tens of millions of years, seafloor spreading will progress along the entire length of the rift. The ocean will flood in and, as a result, the African continent will become smaller and there will be a large island in the Indian Ocean composed of parts of Ethiopia and Somalia, including the Horn of Africa." I guess it is possible that the fissure was responsible for the weakening. We would need to seek out someone better knowledgeable in this area. There may be a relationship between the plate movement (essentially the top of mantle convection cells) and the deep mantle structure, but spreading is happening in may other places (the gulf of California is somewhat analogous to the red sea), and is just part of the normal tectonic cycle. My best guess is that the two aren't casual. As I mentioned elsewhere, a recent PNAS paper shows SLR is accelerating at .08mm/yr^2. One can look at the doubling time of each component and there we see Antarctic Ice Sheets have a relatively low contribution now, though the shortest doubling time, on the order of 6 years. The overall doubling rate of the rise is roughly 35 years. 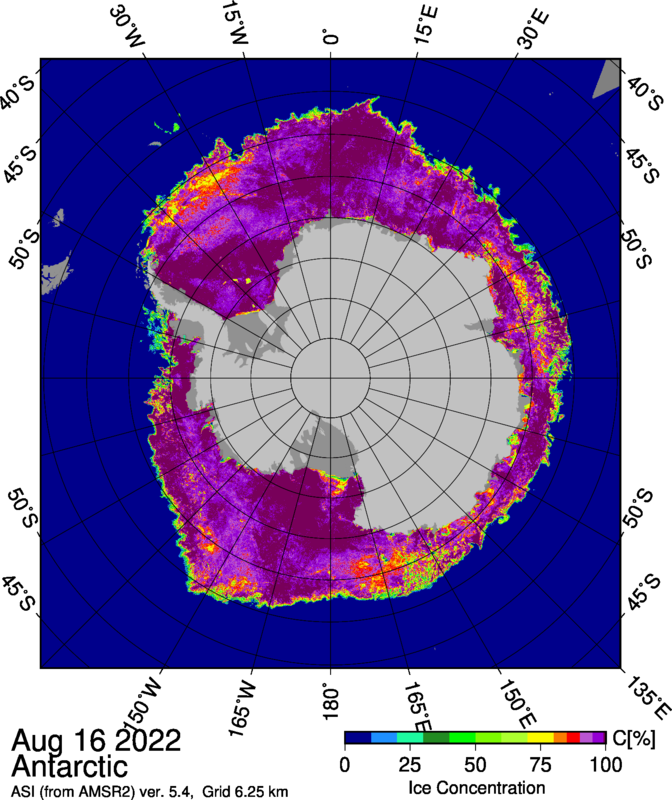 And GRACE data shows the more specific acceleration of the Antarctic Ice Sheets. Tabone, I., Blasco, J., Robinson, A., Alvarez-Solas, J., and Montoya, M.: The sensitivity of the Greenland Ice Sheet to glacial–interglacial oceanic forcing, Clim. Past, 14, 455-472, https://doi.org/10.5194/cp-14-455-2018, 2018. Abstract. Observations suggest that during the last decades the Greenland Ice Sheet (GrIS) has experienced a gradually accelerating mass loss, in part due to the observed speed-up of several of Greenland's marine-terminating glaciers. Recent studies directly attribute this to warming North Atlantic temperatures, which have triggered melting of the outlet glaciers of the GrIS, grounding-line retreat and enhanced ice discharge into the ocean, contributing to an acceleration of sea-level rise. Reconstructions suggest that the influence of the ocean has been of primary importance in the past as well. This was the case not only in interglacial periods, when warmer climates led to a rapid retreat of the GrIS to land above sea level, but also in glacial periods, when the GrIS expanded as far as the continental shelf break and was thus more directly exposed to oceanic changes. However, the GrIS response to palaeo-oceanic variations has yet to be investigated in detail from a mechanistic modelling perspective. In this work, the evolution of the GrIS over the past two glacial cycles is studied using a three-dimensional hybrid ice-sheet–shelf model. We assess the effect of the variation of oceanic temperatures on the GrIS evolution on glacial–interglacial timescales through changes in submarine melting. The results show a very high sensitivity of the GrIS to changing oceanic conditions. Oceanic forcing is found to be a primary driver of GrIS expansion in glacial times and of retreat in interglacial periods. If switched off, palaeo-atmospheric variations alone are not able to yield a reliable glacial configuration of the GrIS. This work therefore suggests that considering the ocean as an active forcing should become standard practice in palaeo-ice-sheet modelling. Title: "Avoid Gulf stream disruption at all costs, scientists warn"
Extract: "Serious disruption to the Gulf Stream ocean currents that are crucial in controlling global climate must be avoided “at all costs”, senior scientists have warned. The alert follows the revelation this week that the system is at its weakest ever recorded. The new research worries scientists because of the huge impact global warming has already had on the currents and the unpredictability of a future “tipping point”." Title: "Stronger evidence for a weaker Atlantic overturning circulation"
Title: "Shift in ocean circulation triggered the end of the last ice age"
Extract: ""This gives us an example of the way that different parts of the climate system are connected, so that changes in circulation in one region can drive changes in CO2 and oxygen all the way over on the other side of the planet," researcher Will Gray said. Scientists modeled the ancient shifts in circulation and ocean-atmosphere gas exchange by measuring the chemical composition of foraminifera, the tiny fossil shells left behind by plankton. Their analysis -- published this week in the journal Nature Geoscience -- revealed an uptick in the amount of CO2 released by the North Pacific beginning 15,000 years ago. Previous studies have found evidence of shifting circulation patterns in the Atlantic at roughly the same time. Earlier this month, another group of researchers published a study showing the Atlantic's circulation is slowing down. Scientists suggest a slowdown could significantly alter climate patterns across the globe. "In our study we see very rapid changes in the climate of the North Pacific that we think are linked to past changes in ocean currents in the Atlantic," lead researcher Will Gray, an environmental scientist at St. Andrews, said in a news release. "This gives us an example of the way that different parts of the climate system are connected, so that changes in circulation in one region can drive changes in CO2 and oxygen all the way over on the other side of the planet."" Extract: "Twenty years ago climatologist James Hansen of NASA's Goddard Institute of Space Studies, widely considered to be the world's leading authority on global warming, first brought the issue into the public spotlight in testimony before the U.S. Congress. Recently, Hansen published an article entitled "Climate Catastrophe" in the New Scientist (July 28, 2007), http://www.newscientist.com. There he presented evidence suggesting that under "business as usual," in which greenhouse gas emissions continue to increase unchecked, a rise in sea level by several meters during the present century due to the melting of polar ice sheets is a "near certainty." A sea level rise of this extent (up to five meters or sixteen feet) would mean the loss of land areas on which much of the earth's population lives at present (10 percent of the world's population live less than ten meters above the mid-tide sea level.). Yet, most scientists, even glaciologists, still downplay the full extent of the danger, failing to acknowledge probable nonlinear processes associated with climate change, and are especially reticent when it comes to making public statements in that regard. Why? Hansen calls this the "John Mercer effect." In the 1970s John Mercer, a glaciologist at Ohio State University's Institute of Polar Studies, drew attention to the West Antarctic Ice Sheet, which is separated from the bulk of Antarctica by a mountain range. Ice shelves floating on its rim put it in a delicate balance so that global warming, Mercer claimed, could within a mere forty years cause it to disintegrate and slide into the sea, raising the sea level by five meters. Other glaciologists looked into Mercer's model and decided based on the data collected that what he described could indeed happen. But most climatologists and geologists publicly dismissed the idea that an ice sheet as big as Mexico could disintegrate in less than a few centuries (Spencer R. Weart, The Discovery of Global Warming, pp. 79-80). According to Hansen, although it was not obvious at the time whether Mercer or his critics were correct, "researchers who suggested that his paper was alarmist were regarded as more authoritative." Hansen believes that Mercer lost funding opportunities as a result. This discouraged other scientists from speaking out. The John Mercer Effect then stands for the fact that scientists (in this case glaciologists) are wary of being similarly characterized as alarmists, particularly because of the impact that this may have on future funding. "Scientists downplaying the dangers of climate change [or other threats to the status quo] fare better when it comes to getting funding." Hansen points to his own experience. In 1981, based on the first reliable estimates of average global temperature by NASA, he pointed to the dangers of global warming from fossil fuel use. The result: his research group had some of its funding pulled by the Department of Energy, which specifically criticized aspects of that paper. Hansen argues that such economic/funding constraints have the effect of inhibiting scientific criticisms of the status quo: "I believe there is pressure on scientists to be conservative." To be sure, scientists are trained to be skeptics, but "excessive caution also holds dangers. 'Scientific reticence' can hinder communication with the public about the dangers of global warming. We may rue reticence if it means no action is taken until it is too late to prevent future disasters." Hansen's description of the John Mercer Effect reflects the way in which a system devoted to what Rachel Carson called "the gods of profit and production" (see the Review of the Month in this issue) constrains scientists (along with everyone else), whenever issues arise that potentially threaten the vested interests-even when it is a question of protecting human life and the planetary environment. In the United States, where so much of the scientific funding comes from the Pentagon and the large corporations, the John Mercer Effect is especially strong in limiting what scientists are willing to say and do. As Richard Levins and Richard Lewontin have written "the irrationalities of a scientifically sophisticated world come not from failure of intelligence but from the persistence of capitalism, which as a by-product also aborts human intelligence" (Dialectical Biologist, p. 208; see also their Biology Under the Influence [Monthly Review Press, 2007])." The linked reference provides a current, limited-scale, real-world example of Hansen's ice-climate feedback. Extract: "Strong heat loss and brine release during sea ice formation in coastal polynyas act to cool and salinify waters on the Antarctic continental shelf. Polynya activity thus both limits the ocean heat flux to the Antarctic Ice Sheet and promotes formation of Dense Shelf Water (DSW), the precursor to Antarctic Bottom Water. However, despite the presence of strong polynyas, DSW is not formed on the Sabrina Coast in East Antarctica and in the Amundsen Sea in West Antarctica. Using a simple ocean model driven by observed forcing, we show that freshwater input from basal melt of ice shelves partially offsets the salt flux by sea ice formation in polynyas found in both regions, preventing full-depth convection and formation of DSW. In the absence of deep convection, warm water that reaches the continental shelf in the bottom layer does not lose much heat to the atmosphere and is thus available to drive the rapid basal melt observed at the Totten Ice Shelf on the Sabrina Coast and at the Dotson and Getz ice shelves in the Amundsen Sea. Our results suggest that increased glacial meltwater input in a warming climate will both reduce Antarctic Bottom Water formation and trigger increased mass loss from the Antarctic Ice Sheet, with consequences for the global overturning circulation and sea level rise." Title: "One of the most worrisome predictions about climate change may be coming true"
Extract: "Two years ago, former NASA climate scientist James Hansen and a number of colleagues laid out a dire scenario in which gigantic pulses of fresh water from melting glaciers could upend the circulation of the oceans, leading to a world of fast-rising seas and even superstorms. The new research, based on ocean measurements off the coast of East Antarctica, shows that melting Antarctic glaciers are indeed freshening the ocean around them. And this, in turn, is blocking a process in which cold and salty ocean water sinks below the sea surface in winter, forming “the densest water on the Earth,” in the words of study lead author Alessandro Silvano, a researcher with the University of Tasmania in Hobart, Australia. "… Labrador Sea deep convection and the AMOC have been anomalously weak over the past 150 years or so (since the end of the Little Ice Age, LIA, approximately AD 1850) compared with the preceding 1,500 years. We suggest that enhanced freshwater fluxes from the Arctic and Nordic seas towards the end of the LIA – sourced from melting glaciers and thickened sea ice that developed earlier in the LIA – weakened Labrador Sea convection and the AMOC. The lack of a subsequent recovery may have resulted from hysteresis or from twentieth-century melting of the Greenland Ice Sheet." These findings support Hansen's ice-climate feedback mechanism. There is a reason why Thwaites Glacier has been nicknamed the 'doomsday' glacier, and why research institutions keep spending more and more research dollars to study this important marine glacier. Title: "Penn State researchers join international effort to study Antarctic ‘doomsday’ glacier"
Extract: "Researchers from Penn State University will be part of a major, international effort to better understand an Antarctic glacier, dubbed the “doomsday glacier” for its potential to contribute significantly to global sea level rise. The Thwaites Glacier on the West Antarctic Ice Sheet is about the size of Pennsylvania. The threat of it collapsing is so significant that the National Science Foundation and the United Kingdom’s National Environmental Research Council today announced $25 million in funding for eight research efforts." Dekker, M. M., von der Heydt, A. S., and Dijkstra, H. A.: Cascading transitions in the climate system, Earth Syst. Dynam. Discuss., https://doi.org/10.5194/esd-2018-26, in review, 2018. Abstract. We provide a theory of cascading tipping, i.e., a sequence of abrupt transitions occurring because a transition in one subsystem changes the background conditions for another subsystem. A mathematical framework of elementary deterministic cascading tipping points in autonomous dynamical systems is presented containing the double-fold, fold-Hopf, Hopf-fold and double-Hopf as most generic cases. Statistical indicators which can be used as early warning indicators of cascading tipping events in stochastic, non-stationary systems are suggested. The concept of cascading tipping is illustrated through a conceptual model of the coupled North Atlantic Ocean – El-Niño Southern Oscillation (ENSO) system, demonstrating the possibility of such cascading events in the climate system. The DOE has now released computer code & preliminary results from ACME (Accelerated Climate Model for Energy) while the DOE has renamed the program E3SM (Energy Exascale Earth System Model), and this world's most sophisticated climate model projects that ECS for the rest of this century will be about 5.2C (& this relatively high value is likely attributable to the state-of-the-art way that ACME/E3SM models aerosols and cloud feedback mechanisms).
" like many models, the E3SM produces two bands of rainfall in the tropics, rather than the one seen in nature near the equator. " O dear. I had hoped it would do better. But further discussion should probably be i a thread on models, perhaps. Title: "Antarctica’s Ice Sheet Is Melting Three Times Faster Than We Thought"
Extract: "Antarctica’s ice sheet is melting three times faster than previously forecasted, according to a report published Wednesday in the journal Nature by 80 scientists. The team said that the ice sheet is melting so fast that 219 billion tons of ice is pouring into the ocean annually—enough to raise sea levels by a half millimeter per year. Between 1992 and 1997, Antarctica was losing 49 billion times of ice per year; from 2012 to 2017, that number increased more than eightfold, according to the Ice Sheet Mass Balance Inter-comparison Exercise. At this rate of acceleration, scientists warn that oceans would rise faster than ever, which means a reduced amount of time for low-lying communities to prepare adequately. “We’re still talking about roughly a half a millimeter per year,” one scientist told The Washington Post. “That isn’t going to sound horribly unmanageable. But remember for the northern hemisphere, for North America, the fact that the location in West Antarctica is where the action is amplifies that rate of sea level rise by up to an about additional 25 percent in a city like Boston or New York.”"
Title: "Invisible scum on sea cuts CO2 exchange with air 'by up to 50%'"
Extract: "The world’s oceans absorb around a quarter of all man-made carbon dioxide emissions, making them the largest long-term sink of carbon on Earth. Rob Upstill-Goddard, professor of marine biogeochemistry at Newcastle University, said: “These latest results build on our previous findings that, contrary to conventional wisdom, large sea surface enrichments of natural surfactants counter the effects of high winds.”"
Hutchinson, D. K., de Boer, A. M., Coxall, H. K., Caballero, R., Nilsson, J., and Baatsen, M.: Climate sensitivity and meridional overturning circulation in the late Eocene using GFDL CM2.1, Clim. Past, 14, 789-810, https://doi.org/10.5194/cp-14-789-2018, 2018. Abstract. The Eocene–Oligocene transition (EOT), which took place approximately 34 Ma ago, is an interval of great interest in Earth's climate history, due to the inception of the Antarctic ice sheet and major global cooling. Climate simulations of the transition are needed to help interpret proxy data, test mechanistic hypotheses for the transition and determine the climate sensitivity at the time. However, model studies of the EOT thus far typically employ control states designed for a different time period, or ocean resolution on the order of 3°. Here we developed a new higher resolution palaeoclimate model configuration based on the GFDL CM2.1 climate model adapted to a late Eocene (38 Ma) palaeogeography reconstruction. The ocean and atmosphere horizontal resolutions are 1°  ×  1.5° and 3°  ×  3.75° respectively. This represents a significant step forward in resolving the ocean geography, gateways and circulation in a coupled climate model of this period. We run the model under three different levels of atmospheric CO2: 400, 800 and 1600 ppm. The model exhibits relatively high sensitivity to CO2 compared with other recent model studies, and thus can capture the expected Eocene high latitude warmth within observed estimates of atmospheric CO2. However, the model does not capture the low meridional temperature gradient seen in proxies. Equatorial sea surface temperatures are too high in the model (30–37 °C) compared with observations (max 32 °C), although observations are lacking in the warmest regions of the western Pacific. The model exhibits bipolar sinking in the North Pacific and Southern Ocean, which persists under all levels of CO2. North Atlantic surface salinities are too fresh to permit sinking (25–30 psu), due to surface transport from the very fresh Arctic ( ∼  20 psu), where surface salinities approximately agree with Eocene proxy estimates. North Atlantic salinity increases by 1–2 psu when CO2 is halved, and similarly freshens when CO2 is doubled, due to changes in the hydrological cycle. "However, if one assumes radiative forcing scenarios close to BAU for the next two decades and projections from Pollard & DeConto's recent work, then Barletta et al (2018)'s finding are actually bad news regarding the potential collapse of the WAIS this century." "The extremely low upper mantle viscosity that we constrain supports the possibility of increased stability of the WAIS with respect to previous studies (16, 17). Lower mantle viscosity leads to faster bedrock uplift in response to ice mass loss. Rapidly rising bedrock shallows the ocean at the grounding line and reduces the buoyancy forces experienced by the edge of the ice sheet while reducing the slope of the bed beneath the ice sheet (fig. S3)"
"In 100 years, uplift rates at the GPS sites will be between 2.5 and 3.5 times larger than currently observed (Fig. 3B), and the bedrock at the Pine Island Glacier grounding line will have risen by about 8 m compared to the present (Fig. 3, C and D). This is about three times higher than values shown to reduce runaway ice surface velocities within 100 years (15). The time required to build sufficient deformation to trigger the stabilization effect is much shorter (27) than in (16). Under low and medium climate forcing, with the onset of the stabilization feedback about two times faster (27), the condition for ice-sheet stability and its possible readvance can reasonably be expected to occur much earlier than predicted in previous studies (16, 17). Based on our estimates, it might produce a deformation large enough and early enough in the deglaciation phase to prevent the complete collapse of the WAIS even under strong climate forcing." The bad news in Barlettta's work is that because of the revised GIA, it turns out that actual ice mass loss over the last few decades is larger than previously thought. "We thus contend that published GRACE-derived ice mass loss estimates for ASE, for example, ~108 Gt/year (1) (drainage basins of Pine Island and Thwaites and Smith glaciers), are systematically underestimated by between 10.0 and 13.9 Gt/year, which is more than 10% of the total ice mass loss estimate for the ASE." I take the Barletta results as good news, since this is the one of the few results that suppress WAIS mass loss rather than enchance it. So the situation is slightly better than I thought. That article looks at GIA as well. But in light of Barletta results, I think they need to revisit their calculations in the Amundsen sector, since the crust beneath is more labile than they assumed. That may explain the lack of skill in that sector. a) The low viscousity of the magma almost certainly means that it is convecting heat upward from the Earth's core faster than previously thought by consensus scientists; which means that the geothermal heat flux through the bedrock is greater, which means that both basal ice melting is higher and that the stiffness of the basal ice is lower. Both of these factors should increase conventional ice flow. b) The local Earth's crust is rising because more rock mass is moving into this area from surrounding areas. This means that as ice mass is lost, the local sea level will not fall as fast as it would have with more viscous magma; which means that there will be more buoyant force on the marine glacier which means it will be less stable. c) More local Earth movement means more seismic and volcanic activity, both of which reduce ice stability. Ice sheet models will need to improve considerably before anyone can conclude that we are all safer than consensus scientists thought before this research was available. Gaia is even more amazing than I thought. This is the asthenosphere, the top part of the mantle where the solidus and the geothermal gradient converge. There isn't necessarily any partial melt (magma), but the viscosity is lower than the upper mantle and the lithosphere (the brittle part of the top of the mantle and the crust). The asthenosphere does flow, and that is where the compensation mechanism for PGR is thought to originate. The ductile flow that is thought to happen as the mechanism for isostatic compensation will not affect mantle convection or necessarily increase or decrease the temperature at the base of the lithosphere. Even if it did the timescales for this change are much greater than the time for ice melt. Thinning or thickening of the lithosphere can effect the geothermal gradient (e.g. you get volcanic activity at rifts). Melting ice effectively thins the lithosphere, and you get pressure release, but also you change the temperature at the crust/ice boundary. I'm not sure how that would effect the solidus/geothermal gradient, but if you do increase partial melt, again, that will take a long time to effect the surface unless you already have existing magma chambers at high levels in the crust. Please review the linked pdf, and see if you are interested in revising any of your statements. Abstract Geothermal heat flux (GHF) is an important part of the basal heat budget of continental ice sheets. The difficulty of measuring GHF below ice sheets has directly hindered progress in the understanding of ice sheet dynamics. We present a new GHF measurement from below the West Antarctic Ice Sheet, made in subglacial sediment near the grounding zone of the Whillans Ice Stream. The measured GHF is 88 ± 7 mW m_2, a relatively high value compared to other continental settings and to other GHF measurements along the eastern Ross Sea of 55 mW m_2 and 69 ± 21 mW m_2 but within the range of regional values indicated by geophysical estimates. The new GHF measurement was made ~100 km from the only other direct GHF measurement below the ice sheet, which was considerably higher at 285 ± 80mWm_2, suggesting spatial variability that could be explained by shallow magmatic intrusions or the advection of heat by crustal fluids. Analytical calculations suggest that spatial variability in GHF exceeds spatial variability in the conductive heat flux through ice along the Siple Coast. Accurate GHF measurements and high-resolution GHF models may be necessary to reliably predict ice sheet evolution, including responses to ongoing and future climate change. Extract: "Current geophysical GHF models underestimate the observed magnitude and spatial variability of GHF, which may be enhanced by magmatism or advection of crustal fluids." Caption for the first image: "Figure 2. (a) GHF measurements and estimates for West Antarctica (Engelhardt, 2004a; Fisher et al., 2015; Foster, 1978; Fudge et al., 2013) and the western Ross Sea region (Morin et al., 2010, and references therein; Schröder et al., 2011) overlain on ice velocity (Rignot et al., 2011). Grounding line outlined black (Bindschadler et al., 2015). Profile line (A-A0) shown in black. Extent of GHF estimates below Thwaites glacier (THW, dashed line) (Schroeder et al., 2014). (b) Estimates of spatial variability in heat conduction and production along the profile line shown in Figure 2a, as difference from mean conductive heat flux along that profile (79mWm_2). (c) Shear heat flux estimates calculated from ice velocity and associated errors. GHF measurements and estimates close to the profile line are plotted (mean ±1 SE, SLW value lies off axis)." Caption for the second image: "Figure 3. (a) Analytical model for GHF based on Fox Maule et al. (2005) (black and gray lines) compared with GHF measurements and estimates (blue) as a function of magnetic crustal thickness. The SLW value lies well above the plot. Dotted lines show the envelope of ±15% variation in crustal thermal conductivity from 2.8 W m_1 °C_1. (b) GHF anomaly due to modeled magmatic intrusions with cubic geometry. Intrusion depths are the distance from the surface of the crust to the top of the intrusion. GHF values are the maximum achieved at the surface over the center of the intrusion. Black contours represent mean ±1 SE bounds on GHF at SLW. Gray contours mark the time since emplacement at which the maximum GHF values plotted are achieved. (c) Probability density functions of GHF models for West Antarctica (An=An et al., 2015; FM=Fox Maule et al., 2005; SR=Shapiro & Ritzwoller, 2004) and GHF measurements in the Basin and Range Province, USA, 16% of which exceed 300 mW m_2 (National Geothermal Data System). In Figures 3a and 3c, GHF measurements and estimates for West Antarctica are plotted as mean ±1 SE, where available (references in Figure 2). GHF estimates below Thwaites glacier (THW), shown in Figure 3a, plotted as mean, ±1 SD (solid line), and the full range of THW values (dotted line) which extend off axis to 375 mW m_2 (Schroeder et al., 2014)." The attached Sentinel-1 image from June 21, 2018, indicates that the SW Tributary Ice Shelf has already experienced a major calving event, and we will see whether the PIIS experiences a major calving event in the same vicinity within the next year. To paraphrase the paper "There's magmatic activity in the rift under the ice sheets; it shows up as concentrated hot spots under the ice; it looks like modern rift regimes; models underestimate the special variation and intensity; but we don't have a lot of data; it might be important"
What I wrote was really to correct your first paragraph. Low viscosity magma does not conduct heat from the earths core. Heat is transported from the core by mantle convection, and that is certainly not magma; It also takes a LONG time, it's about 2500km and it convection is thought to move at 20mm a year. Changes to it are not likely to effect the ice regime in the next 10000 years. I probably should have been more direct and not got into where magma actually forms and how pressure/temperature changes could produce more magma. This paper finds an extremely high heat flow and low viscosity that is best explained by partial melting in the upper mantle. The heat flow is higher than the basin and range which has a low velocity zone and ongoing volcanism. If there's a rapid ice mass loss there will be decompression melting. This could increase volcanic activity as the ice melts as happened during the late Pleistocene in Alaska and Iceland. This rapid isostatic adjustment is only good news if we stop emitting GHGs. Perhaps, then, the ice would find a new grounding line. If we keep the heat on with GHG emissions this will only add to the melting which we now know is already worse than we thought. This isostatic adjustment rates found in the study are stunning, but the will not be fast enough to compensate for accelerated melting if we keep our feet on the gas pedal. Thank you for the clarifications. I concur that the main points of concur are the numerous pre-existing concentrated hotspots under the ice, and I also concur with FishOutofWater that if we continue BAU emissions for much longer, the isostatic adjustment rates will not be fast enough to compensate for the other consequences of ice mass loss. Title: "Researchers discover volcanic heat source under major Antarctic glacier"
Extract: " A researcher from the University of Rhode Island's Graduate School of Oceanography and five other scientists have discovered an active volcanic heat source beneath the Pine Island Glacier in Antarctica. The scientists conclude by writing: "The magnitude and the variations in the rate of the volcanic heat supplied to the Pine Island Glacier, either by internal magma migration, or by an increase in volcanism as a consequence of ice sheet thinning, may impact the future dynamics of the Pine Island Glacier, during the contemporary period of climate-driven glacial retreat."" The Thwaites outflow seems to be increasing, and to be warm! , much of the near glacier waters are shown to be ice free - see the close up below. Given ASLR's latest post, 2 above, perhaps the focus of the research should have been on the Thwaites, not the PIG.